This month the WD BLACK SN750 is being released as WD’s latest generation of high-performance NVMe SSDs. Based on the prior generation WD BLACK with identical NAND (the new 2TB model excepted) and controller, it nonetheless incorporates an updated firmware for improved performance characteristics. Adhering to the now-commonplace M.2 2280 form factor, it will reach Sequential Read/Write speeds of up to 3470MB/s and 3000MB/s respectively over the 4-lane PCIe 3.0 interface. 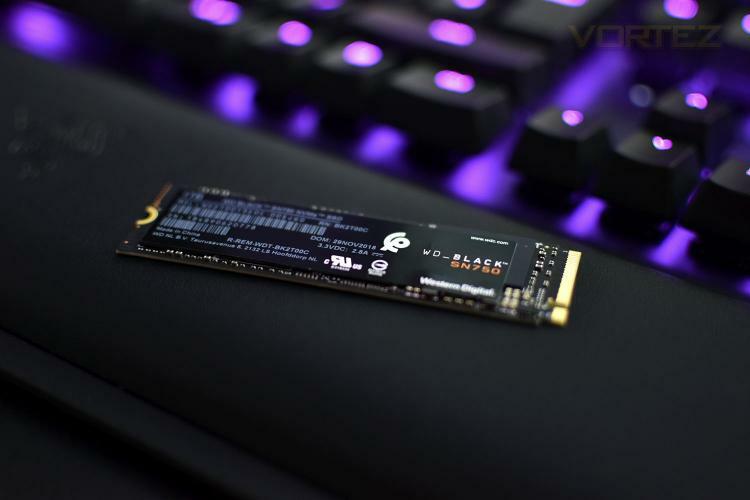 That puts it in rarefied company alongside some of the biggest players in performance NVMe SSDs, and likely close to the peak of what’s possible prior to moving to PCIe 4.0 in the next few years. In addition to a familiar single-sided M.2 drive design, the SN750 will later this quarter also offer variants with a built-in heatsink. The cooling, which is designed in partnership with EK, addresses the core issue of temperature-dependent throttling under extended saturated usage. It should also look slightly more attractive in PCs compared to just having the bare drive (complete with product information label) exposed. The WD BLACK SN750 is being sold in 250GB – 2TB form factors, with the latter making use of their newer 512GiB memory chip to keep it single-sided. SKUs with and without heatsink are available (the former from March 2019), and as standard performance levels will differ based on the model capacity. The MSRP starts from $89.99, reaching $499 for pre-orders of the 2TB model. The launch of the WD BLACK SN750 is part Western Digital’s effort to bolster WD’s presence in the Gaming sector, a market which continues to exhibit strong growth. WD Gaming has recently been a presence at Esports tournaments and other industry events such as ChinaJoy, with the brand showcased to millions of viewers on worldwide streaming platforms. The SN750’s software dashboard has also been designed with future developments and product launches in mind, although WD themselves are closed-lipped about the form they may take.